The high performance weberend MT render system from Weber has been specified for a bespoke, luxury private home on the south Hampshire Coast. Recommended applicator Complete Rendering Systems Limited of Lewes, East Sussex, carried out the render application for main contractor MGS Building & Electrical Contracts Limited, Botley, Southampton. "The orientation of this site presented a challenge," says John Saint, director, MGS Building & Electrical Contracts, "but as we come across difficult sites and ambitious architectural designs more frequently, we have to use materials that are suited to the task." There were two substrates, totalling 360m², which required the application of the lightweight weberend MT system: the house structure features timber frame with Bluclad render substrate boards, while the garage facility is built of traditional blockwork. Both are ideally suited to the application of the versatile weberend MT system. The finish colour is white for the majority of the property with the stair core picked out in grey. Created by the award winning contemporary design practice A R Design Studios, Winchester, specialists in residential and commercial architecture, chief architect Andy Ramus comments that the palette of materials used in the design of the property is intentionally modest and understated: "White and grey render adorn the 'floating' box which accommodates the upper sleeping floor while local stone is used for the walls that dominate the ground floor providing a rugged contrast." weberend MT is a multi-coat system which incorporates glass fibre meshcloth reinforcement and a resin-rich adhesive coat that carries a choice of textured finishes in a wide range of colours. The clean aesthetic lines of this stylish property are enhanced by the striking textured finish. 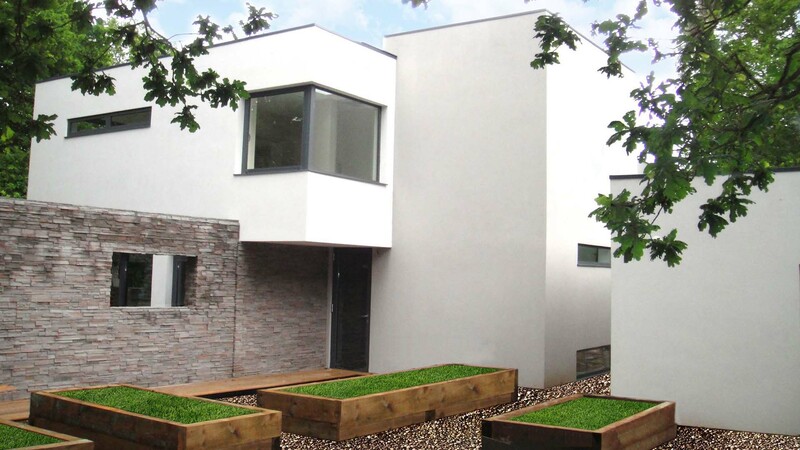 Bradley Halls, director of Complete Rendering Systems, has considerable experience of Weber render systems. "To create the weberend MT system, we pump spray the first coat of weberend LAC onto the stable Bluclad boards which provide good adhesion," says Bradley. "We immediately lay in the meshcloth which is covered with a second spray-applied coat of weberend LAC. We float the surface flat and dry-sponge to achieve a smooth, flawless finish." When dry, weber PR310, a pigmented primer, is applied which starts the colour build-up. It also reduces the suction levels in preparation for the top coat to achieve uniform colour and texture. The webersil TF textured silicone-based decorative finish coat was hand applied. Built on the site of a single bungalow this one-for-one property offers spacious accommodation over three floors. It has a lower ground floor with cellar and cinema and an impressive ground floor lounge with large sliding glazed doors. 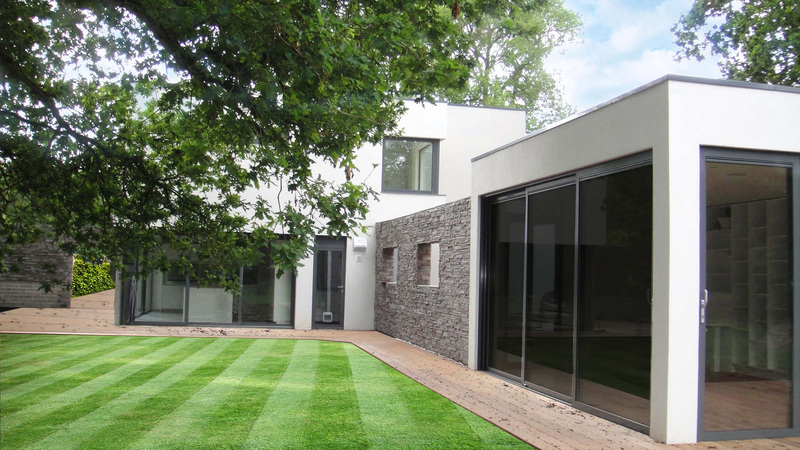 Flush thresholds provide a true sense of inside/outside living while glazing to the bedrooms provides beautiful tree top views of the lake and the four themed private gardens. A moat surrounding the house is crossed via a bridge providing direct access to the main entrance.